Alone at least 2 years on the streets, having babies and more babies. We have no idea what happened to the babies. Now, there is no way this is any kind of life to lead, yet no one helped the cycle stop. People fed her and noticed she was pregnant and not and pregnant again. This time someone asked for help for Astrid. This poor mama cat is maybe 8 years old and still having babies on the streets. This is definitely her last litter and she is now safe inside with her only surviving baby. One was stillborn, another passed away at only about 48 hours old. How horrible for this mama cat to be continuing to go through this. 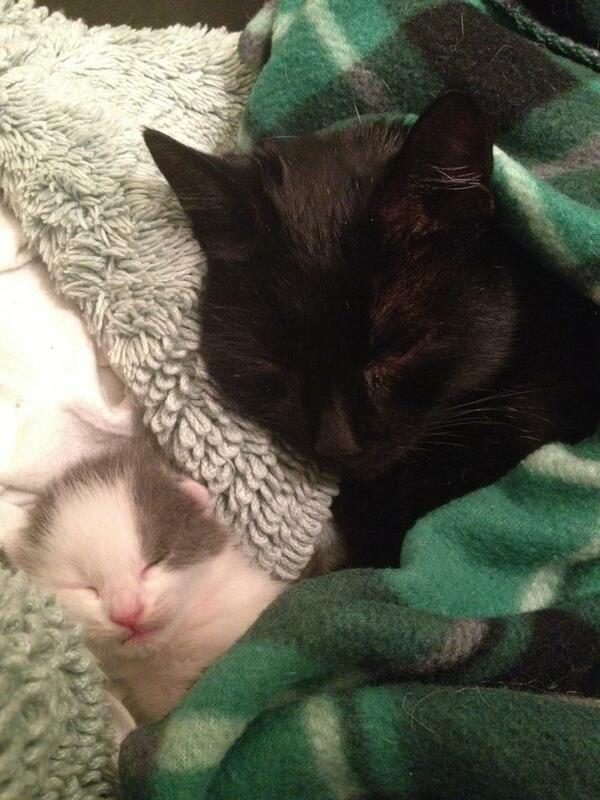 During her vet exam, it was also discovered that she has a horribly decaying mouth that will need extensive work when she is done nursing the little one. An 8 year old cat with FIV and totally black has only a sight chance for adoption, but she still deserves to live and give it her best shot at adoption. She definitely deserved better than giving birth on the streets continuously with the babies likely not surviving. At the very least, this little lady will be able to get her horrible mouth fixed and relax for the rest of her life. At the very best, she will be snuggling in a circle of family love someday. 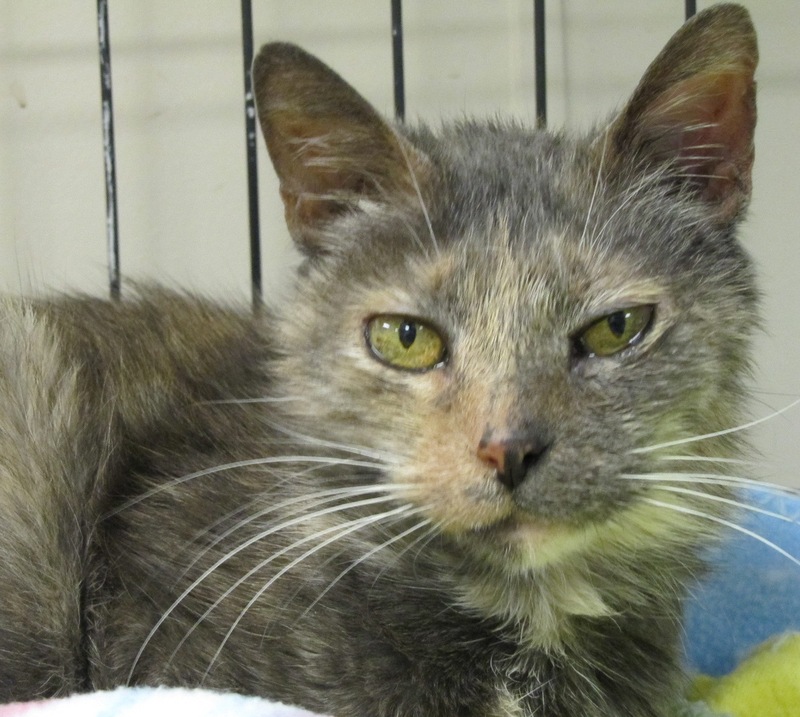 Please help us care for sweet Astrid and her surviving baby. None of us can imagine this happening to us. 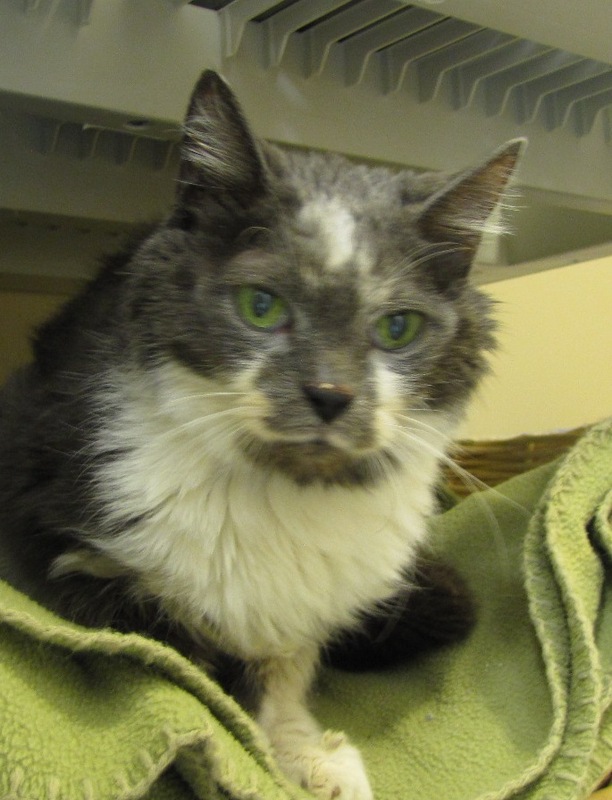 Poor Shadow Gray’s person passed away and no one in his person’s family wanted him, so he found himself in a high intake shelter, not knowing anyone and he was already ill. What he did have going for him was a pair of eyes that could make that special plea to everyone for help. His sea foam green eyes against his gray fur couldn’t be missed. 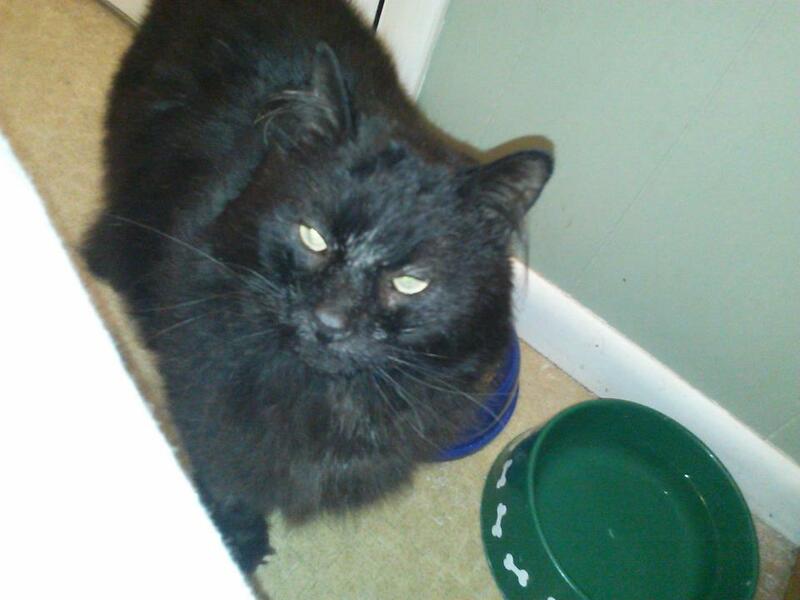 Shadow only weighed 4 pounds and a matted mess. 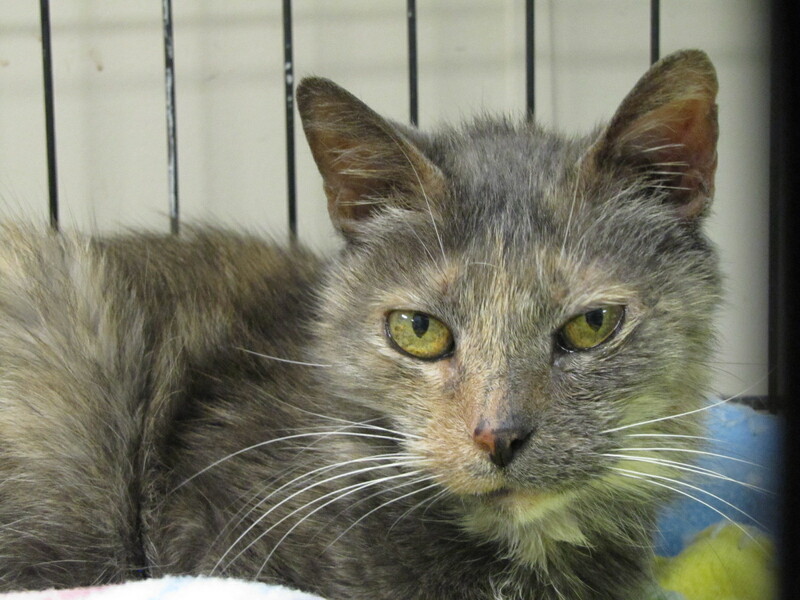 A plea went out for help for this incredible kitty and we answered it. Shadow was hyperthyroid, fairly common in older cats. There is a drug not labeled for cats that we could give him to treat the symptoms. The drug is extremely harsh, many cats cannot tolerate it and you must constantly monitor blood work on these kitties making sure they are getting the correct dose. HELP Humane prefers to get the treatment to cure the hyper thyroid. The cost is higher up front but it cures the condition and in the long run, its less expensive than the pills (that can be dangerous) and the blood work to keep going in the right direction with treatment. 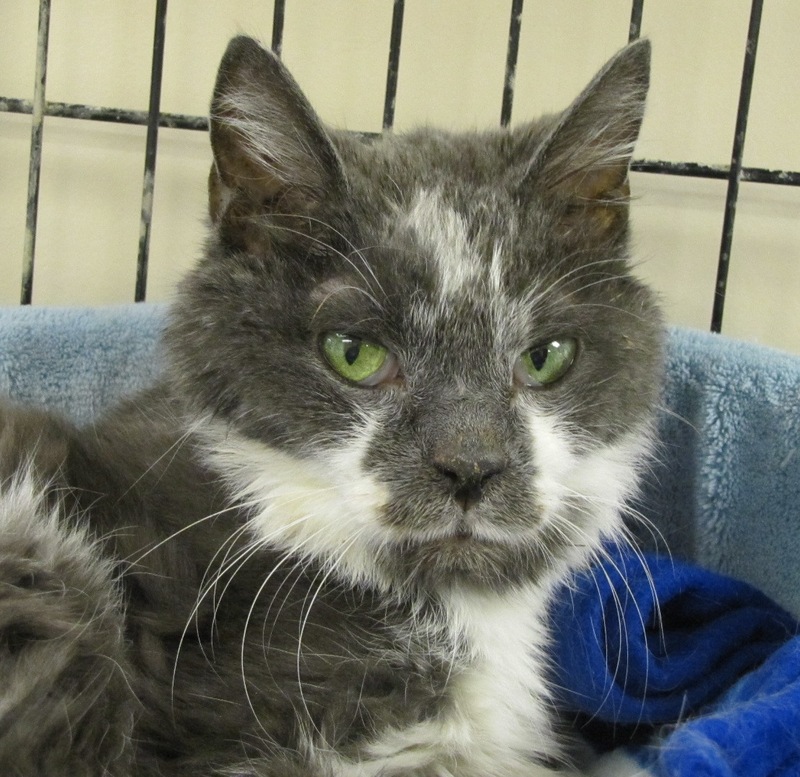 In January, Shadow Gray had his hyperthyroid treatment and several weeks later, he began to gain weight like a champ. Then he suddenly lost several ounces in a week, not good. We had him back to the vet and discovered that he has kidney disease. We will manage his kidney disease and give him a good rest of his life, which could be a long time considering kidney disease can certainly be managed in a kitty. We adore this handsome grandpa and are pretty sure he is fairly fond of us also 🙂 We are so happy to be able to help the helpless animals when they find themselves in what seems to be the worst situation possible, knowing no one and dependent on a kind hand. This gentle soul doesnt have to worry about that anymore! This petite little girl found herself in a predicament, actually a couple of them. The first one was when she found herself lost on the streets, of course, no one will know if she was lost or abandoned but either way, on the streets. She is so tiny and was very thin when she was brought in to a high intake shelter. An amazing supervisor there took her under her wing and gave her special feedings to try and get some weight back on her, but it didnt go so well. She ate well but barely gained any weight so the supervisor had taken her as far as funds from the city would take her and she reached out for help for this little one. A Good Samaritan paid for blood work to find out what might be amiss in which an idea on what was going on inside. Then we took over her care from that point. Not much on bloodwork and we ran more along with xrays and other tests. Right now, we are giving this quiet little soul lots of TLC and time, time to recover and recouperate, time to prepare for another start at life, a fresh one. We will give her all she needs until she is ready and able to move on to that new family that will love her like we do. His caretaker agreed to hold onto him until there was an opening at our Feline Leukemia Cottage where he could have a great life hanging with friends and watching all the wildlife on their screened in porch. After only a short time, Dion’s foster mom noticed that he was having balance problems and off to the vet he went again. He was extremely dehydrated and had multiple issues including parasites and spent a week being hospitalized. He then was allowed to go back to his foster home and did great for a short period of time before he again had a crisis and at that time, he was diagnosed with an enlarged heart. At that point, we knew his time was limited but we hoped for the best. Poor Dion was a young long haired black cat, not a stand out from the crowd boy but he got dealt a crummy hand and after only a few weeks back at his foster home, he had multiple seizures and passed away before he could even return to the vet. 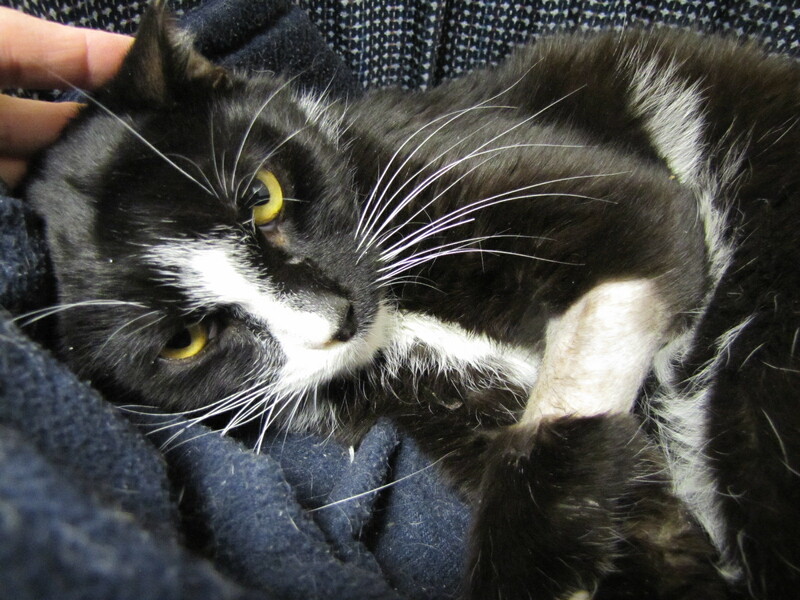 Such a loving little soul that purred through all the medical procedures, we believe he knew he was getting help. We know he is at peace now, we just wish we could have helped him sooner. Wellington’s plea was posted on a high intake shelter’s page for rescue, they were not able to help him and his time was limited. Animal Control was called to an address about an injured cat. 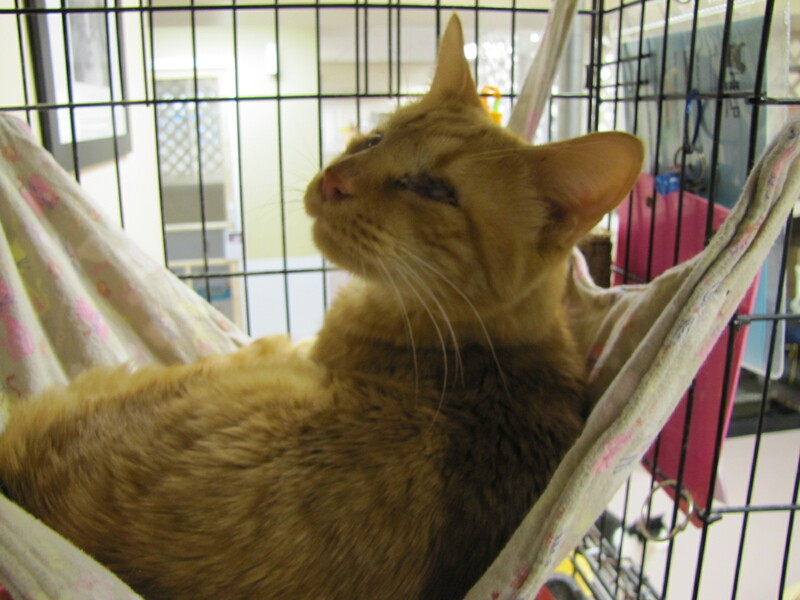 This resident had called saying a cat had drug himself onto her porch and was unable to move. We have rescued several cats like this and they have just needed some medication and rehabilitation time and they recovered. In the picture posted on their page, Wellington’s gorgeous copper eyes just looked into ours (and many others) souls, he just needed some help. 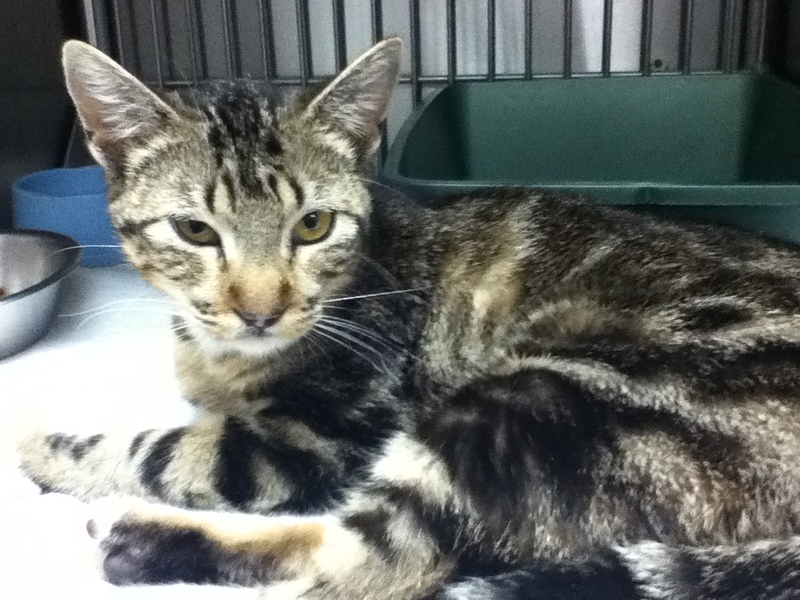 Wellington has an eartip (that means that has was part of a trap/neuter/return) program at one time. We obviously dont know his story but at this time our vet believes that he has a parasite and we are treating him for that. He is regaining strength every day and eating like a champ. And those copper eyes are brighter and more hopeful. He is still a bit apprehensive of people and loud noises but he is getting better every day. This boy is full of spirit and love. He was born with small underdeveloped eyeballs that have no sight. He was taken in by a family at 8 wks old and given up to a high intake shelter at 9 years old. We were contacted by someone to pull him from the shelter as they were going to have a difficult time finding him a home. 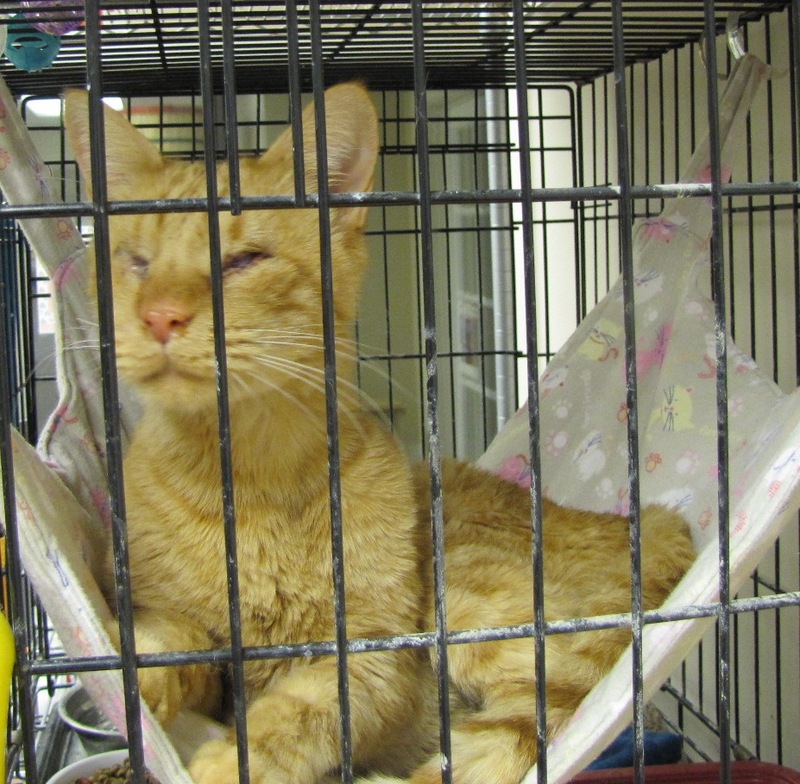 When he got to HELP Humane, he had a serious eye infection, well, guess I should say eye socket infection. With antibiotics and eye drops, his sockets came around great and he is much more comfortable now. Jacques came to us rail thin and his coat was a greasy mess. Since then he has filled out to a perfect weight and his coat is soft as a bunny’s fur. He gives the best hugs ever, he is actually holding on to make sure he is safe but we count them as hugs. During one of his exams, the vet noticed he was painful in the area of his stomach. After xrays and an ultrasound, the vets are still not exactly sure what is happening in that area. Right now we are waiting to see what happens. He needs to have the underdeveloped eyes removed and the sockets sutured shut so that he will not have the infections. This boy plays with toys and looks across the room at you coming as if he does have sight, however, he does not. Add to all of this that he was declawed, so he has no sight and no claws (his first line of defense) and its just amazing how he is still such an amazing personality. He deserved help and we are so happy to be able to give it to this boy. A couple of weeks ago someone contacted us about finding a cat at their place of employment that was rail thin and had labored breathing . She took the kitten home but couldn’t afford to take her to the vet. We have been cautious on intake while we build our shelter buddy support so while pondering payment for what I thought was going to be a diaphragmatic hernia, we got a call. A call from a couple that wanted to make a donation to help start-up an Emergency Veterinary Care Fund in memory of a precious dog they adopted and changed their life. So I felt comfortable with bringing her in for care, we just had to figure it out! As it turned out, this six month old princess did have a diaphragmatic hernia. This is when the intestines are up in the chest cavity not allowing the lungs to fully expand. This can be a congenital defect but more often it’s caused by trauma. Laya was off to see the surgeon to determine if she was a good candidate for surgery; she was. On April 17, she went under for surgery, this surgery is very risky but must happen in order for her to live. We were all holding our breath, thinking good thoughts and several hours later the surgeon called to say she was out of surgery and had done really well. This was despite the fact that once inside she found the injury was an old one as scar tissue had grown. She was being kept highly sedated to keep down the pain but the surgeon felt good about the outcome. The next 24 hours are critical so not being able to sleep, I called about 12 hours after her surgery to check on her and they said she was now up and around and purring! Everyone is crazy about this little sweetheart. Even though she must have pain from the surgery, she just has to already feel so much better being able to breathe without struggling. This little girl must have been in horrible pain when the trauma first happened and since then she has been struggling to breathe. Animals cannot just walk into a hospital ER and ask for help, they have to look with their eyes and hopefully make eye contact with someone who will stop and help them. We are so grateful this little princess survived what she went through and will soon be looking for her very own family. We havent got the total on her veterinary bill yet but some other donations have also come in to help out. We are so appreciative for the donation that first started her rescue and those that have donated since, YOU are the reasons she will soon be surrounded by love at the shelter as she awaits that purrfect family, thank you! !